NOT TO BE USED BY THOSE WHO ARE PRONE TO HAY FEVER OR BY WOMEN WHO ARE PREGNANT OR NURSING. 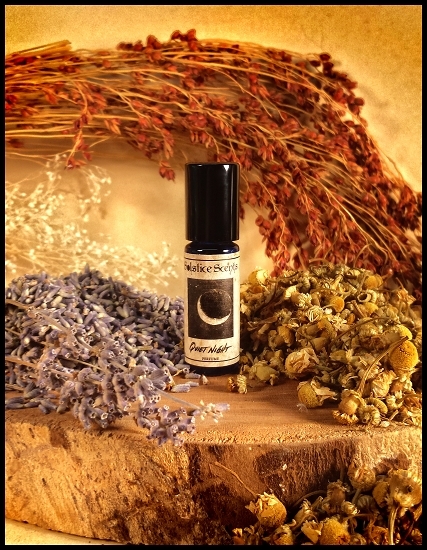 Quiet Night is a wonderfully calming perfume of Lavender & Roman Chamomile Essential Oils in rice bran oil. This blend is primarily for aromatherapy purposes as opposed to a long-lasting perfume. In Aromatherapy, Lavender and Chamomile are both traditionally used to combat insomnia. 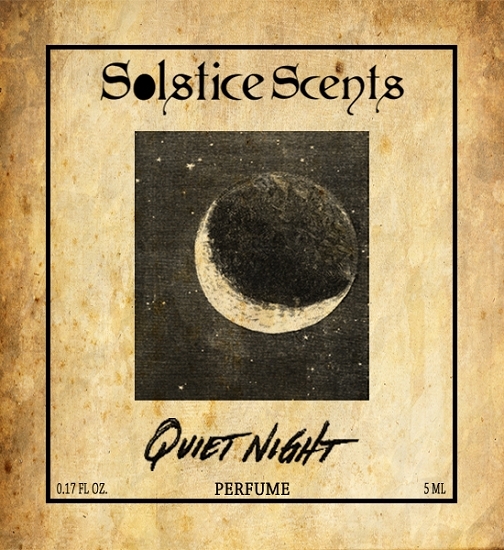 Lavender's strong, herbaceous and slightly floral aroma marries with a soft background of Roman Chamomile's sweetish, warm-herbaceous and faintly apple like fragrance, whisking you away under the cloak of night to be free to dream and sleep peacefully. Lavender is also indicated for headaches, migraines, stress and anxiety, so you may enjoy carrying this perfume with you throughout the day should you need a lifeline to help combat the start of a headache or nervous tension. Dry down for this fragrance is very soft and subtle and does not have the staying power of synthetic perfumes. This fragrance starts off with a strong burst and calms down to a mild blend after only a few minutes. Apply this potion on chest, neck, and anywhere else you desire. Adjust your bedroom so that it is conducive to getting a good night's rest. Some people like to sleep with a nightlight, others need complete darkness and silence. If your mind is racing, make a list of the things that are preventing you from sleeping. If you are thinking about all things you have to do tomorrow, make a to-do list and then tell your mind it is time to calm down. Make sure to keep your work/hobbies in a separate room. The bedroom is for sleeping, and when you bring other activities into the room, your mind sometimes cannot separate itself from focusing on other things. Chamomile, valerian and skullcap are all herbal teas that you can drink before bed to help you wind down and relax (consult your health practitioner before starting any herbal remedies).